I aim for regularly scheduled blog posts as I see foodforfun as an extension of my business and a professional commitment of sorts. Topics are chosen because they answer my daily question of, “what’s been fun in my culinary world today”? But some days–though it could be me rather than the day–lack inspiration. Take today: A quick breakfast (oatmeal, cottage cheese, grapefruit), lunch at church (the standard line-up of French toast, bacon, and fresh fruit, though the yogurt buffet was snazzy). Supper was a fridge clean-out as we made a meal of leftovers from the past week. As well, I spent much of the day helping my girls with homework, so no time to play in the kitchen. Come evening, I had no clue what I could write up for the day’s blog post. Rather than skip it, though, I asked myself what sounded like fun. How about an end-of-weekend cocktail? When I opened the liquor cabinet, I noticed a deck of cards I’d purchased on last year’s summer vacation. I’m still wondering why Mitchell, South Dakota’s Corn Palace gift shop carried Drink Recipes Playing Cards, but they sold me on them and I’ve enjoyed the occasional shuffle through the deck. (Note that the drink names are not child-friendly, though neither are alcoholic drinks so it works.) I’d never actually used a recipe from the deck, though, and decided that tonight was the night. I found four cards that interested me–each recipe had three (or fewer) ingredients, those ingredients were already on hand, and they sounded tasty. 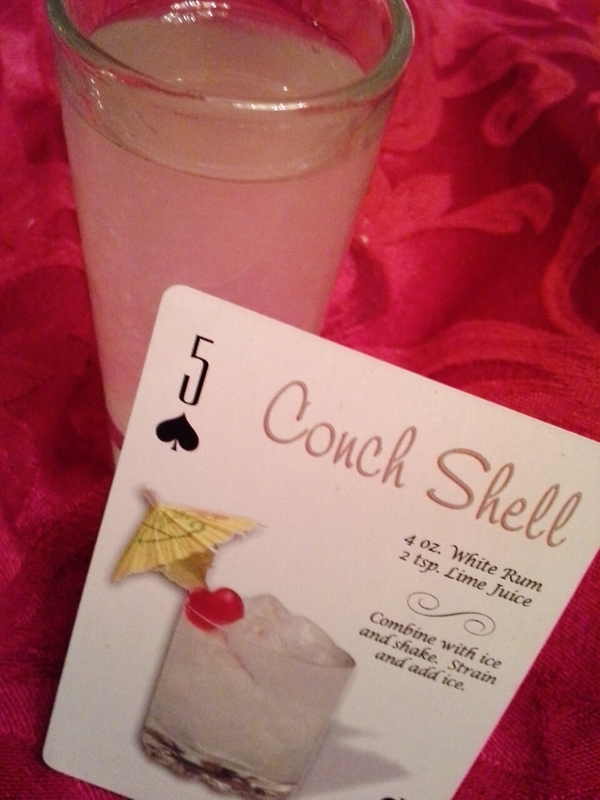 Conch Shell: I liked this one very much, though a spritz of club soda would have made it easier to drink. It was the most refreshing cocktail of the bunch. But if you only like sweet drinks, it’s not for you. 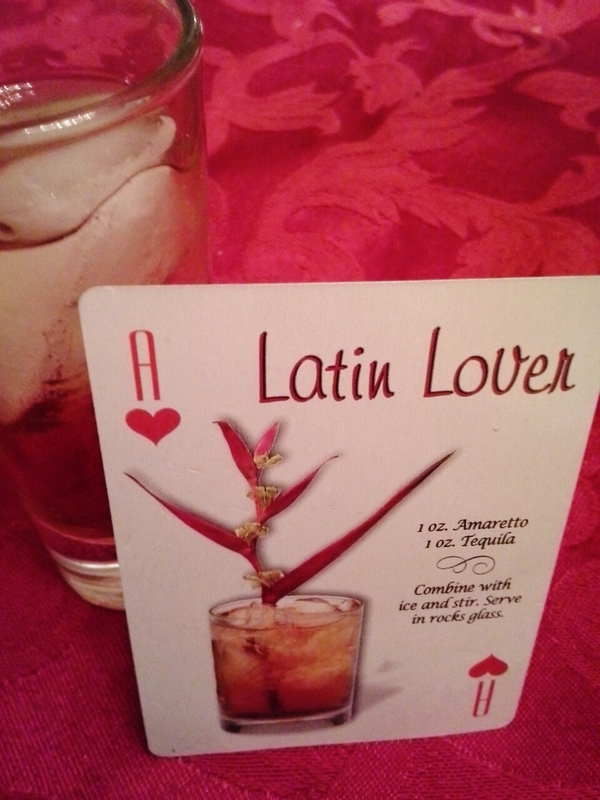 Latin Lover: Again, needs a spritz (or two) of club soda as it’s strong booze. I like that it’s served over ice as the melt helps dilute. 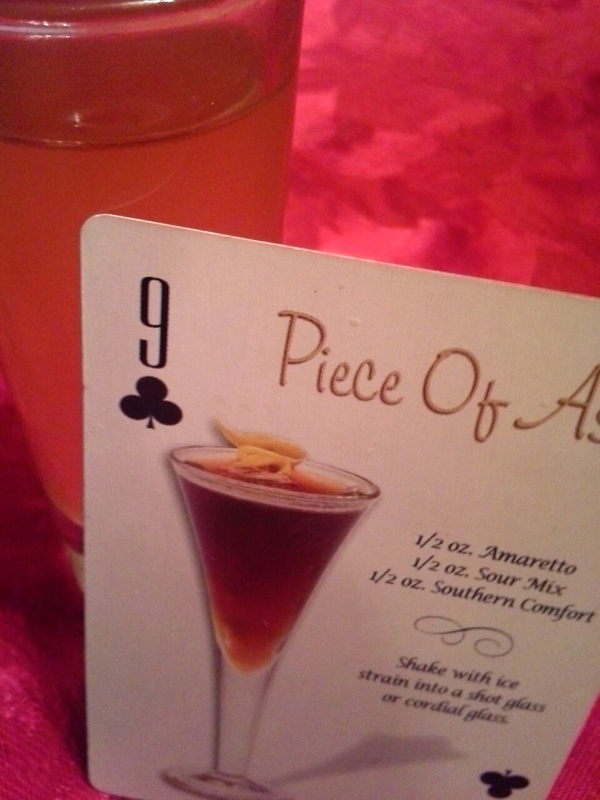 The flavors of amaretto and tequila blend nicely. 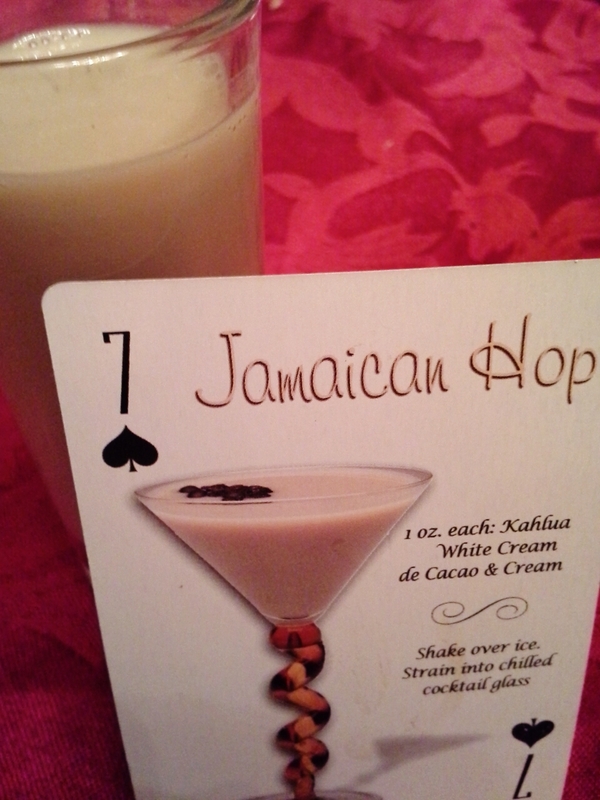 Jamaican Hop: Here’s the drink I downed after snapping the photo. 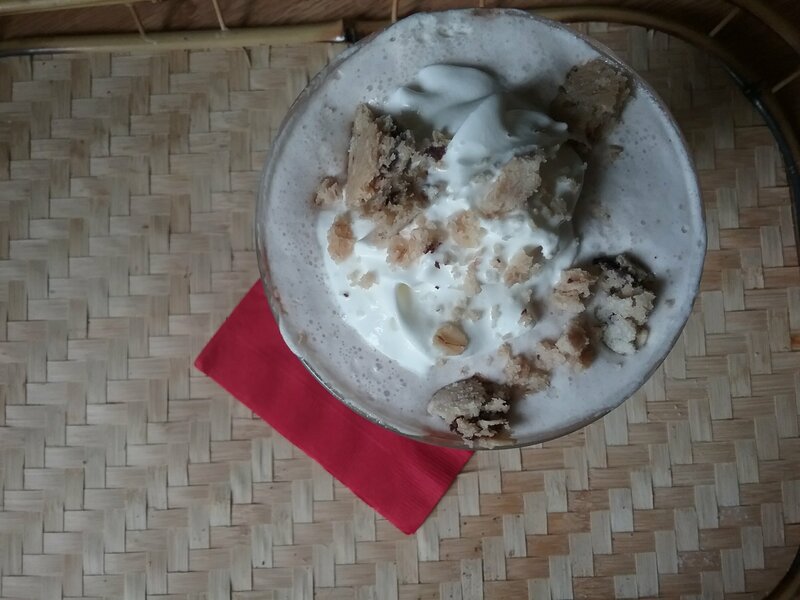 Smooth, creamy, lightly sweet–dessert in a glass. 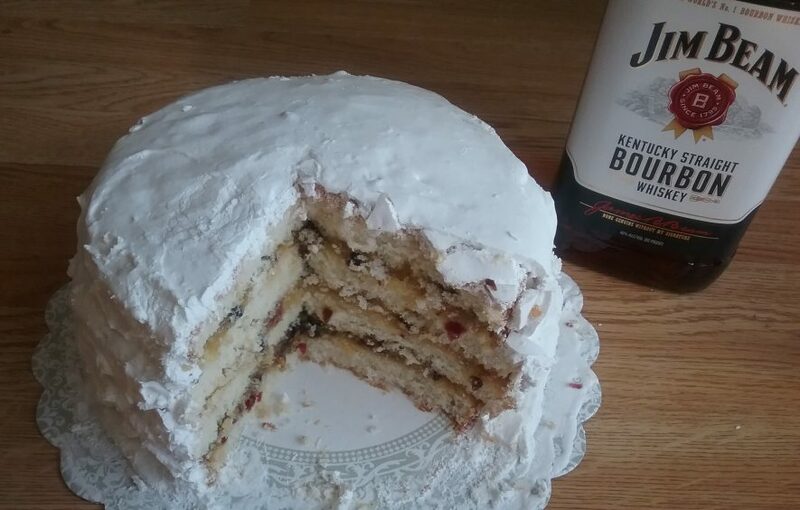 I used fat-free half-and-half instead of cream. Piece of A-hem: I didn’t pick this one for the name, for sure. I recently made homemade sour mix, so am always looking for fun new uses. As well, I like mixing Southern Comfort with other flavors. This one was knock-out strong, too much so for my tastes. I’d drink it again only if it was diluted at least 50/50 with club soda. So by night’s end, I had found my inspiration by adding four new cocktail recipes to my arsenal. Not every day is inspiring, but if we think on it long enough, we can usually find something to make us smile.